The two countries’ Navies hold their Indra series of naval wargames once a year. Russian ships will arrive at Visakhapatnam port on the southeast coast of India in the state of Andhra Pradesh on December 6 to take part in the Indra joint naval maneuvers, a source close to the Indian Ministry of Defense told TASS on Tuesday. "The exercise will be held from December 7 to 12 this year; the welcoming ceremony for the detachment of the Russian Navy ships is planned for December 6," he said. 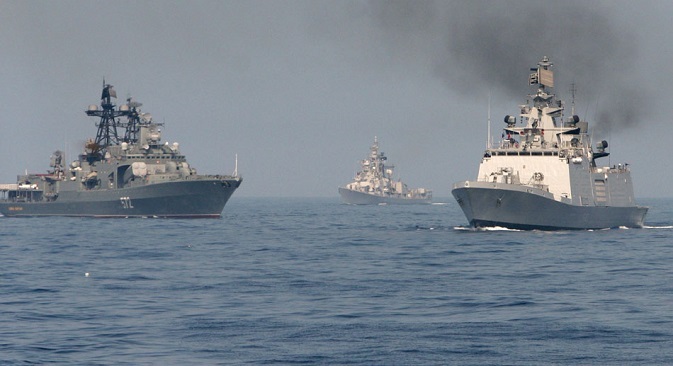 According to him, taking part in the drills from the Russian side will be a missile cruiser, a destroyer, a large sea tanker, a tugboat and two naval helicopters, and from the Indian side - a multipurpose frigate, a destroyer, an anti-submarine plane, a Coast Guard plane, two training planes and a helicopter. "The maneuvers will focus on drilling antisubmarine defense of ships, gun practice on surface and air targets. Also, it is planned to conduct anti-terrorist operation drills to rescue a ship seized by hypothetical terrorists in which assault teams, supported by helicopters will be landed on board the ship," he added. Earlier this month, the Indra joint exercise of ground troops that involved more than 500 soldiers from both sides was held in the north-western Indian state of Rajasthan. The exercise focused on drilling joint actions within a combined peacekeeping battalion, including blocking of a hypothetical conflict area and neutralisation of illegal armed groups. The troops also drilled defusing explosive objects and improvised explosive devices, as well as rendering first aid. Russia has been India’s largest defense supplier for long, increasing military sales worth over $45 billion since the 1960s, but their armed forces do not exercise much together. While the first Indra exercise was held at the Mahajan ranges in Rajasthan in 2005, the second was conducted at Pskov in Russia in 2007 and the third at Chaubattia near Ranikhet in Uttarakhand in 2009. Thereafter, the Indra exercise has been held once every year between the two armies. The two countries’ Navies now also hold their Indra series of naval wargames once a year. Indian and Russian air forces held their air combat exercise, Ex Avia Indra, for the first time at the Astrakhan region near the Caspian Sea in August-September last year. In sharp contrast, India and the United States have held more than 80 joint combat exercises over the last decade.